The Perl debugger, a part of the core Perl distribution, is a useful tool to master, allowing close interactive examination of executing Perl code. 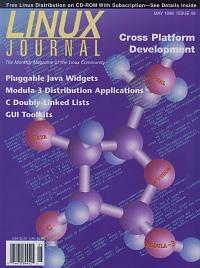 An introduction to writing pluggable do-it-yourself widgets for the Java programmer. Mr. Kominek introduces us to the Modula-3 language and shows us how it can be used for cross-platform programming. The ADT concept is at the heart of object-oriented programming and cross-platform development. Mr. Nobile gives us an example with his doubly linked list libraries. The fragmentation of development energy into too many GUI toolkits is one of the most serious problems facing the Linux community today. A discussion of rapid prototyping and how it can benefit programmers in creating software to match the customer's needs. The programming infrastructure, such as ToolTalk, is a major strength of the Common Desktop Environment. This article illustrates client and server plug-and-play through the use of the Desktop's Application Programming Interfaces (APIs). A Python SIG has put together a DB-API standard; Mr. Kuchling gives us the details. Toward Greater Portability: A Quixotic View by Graydon L. Ekdahl, Ph.D.
gprof, bprof and Time Profilers Mr. Vaught shows programmers a few commands to determine which sections of their code need optimization. Linux on Track: Data Acquisition on German High Speed Trains Linux was used in two projects as a data acquisition system running more or less autonomously in the German ICE trains. This article describes design issues and implementation as well as the problems and solutions used in those projects. RAID0 Implementation Under Linux A practical guide to setting up and using a RAID0 device with the multiple device (md) driver. KDE and GNOME A quick look at two projects designed to make the administration and usage of a Linux system easier for beginners.